SOUTHWEST HARBOR — Mount Desert Island Hospital’s Community Dental Center is pleased to announce that Debra Byers, DMD has joined its practice. “We are thrilled to welcome Dr. Byers to our team,” says Lauri Kandutsch, Practice Manager for both the Community Dental Center and the Community Health Center. Under Dr. Byers’ leadership, the Community Dental Center will provide a full complement of oral health services including general and pediatric dentistry, extractions and implants, restorations and fillings, tooth-whitening, crowns, bridges, root canals, same-day emergency dentistry and oral surgery. “It is my goal to provide comprehensive patient care to our community,” says Dr. Byers. In addition to general dentistry, Dr. Byers’ dental interests and expertise include implants and restorative dentistry. She received her Doctor of Medicine in Dentistry degree from Fairleigh Dickinson University School of Dental Medicine in Teaneck, N.J. and completed an American Academy of Implant Dentistry MaxiCourse® in surgical implant dentistry. Dr. Byers first came to the Mount Desert Island area from Western New York because she enjoys living in a semi-rural environment. Outside of work, she has many pets and enjoys working with animal shelters. She also likes to travel and attends frequent continuing education seminars. 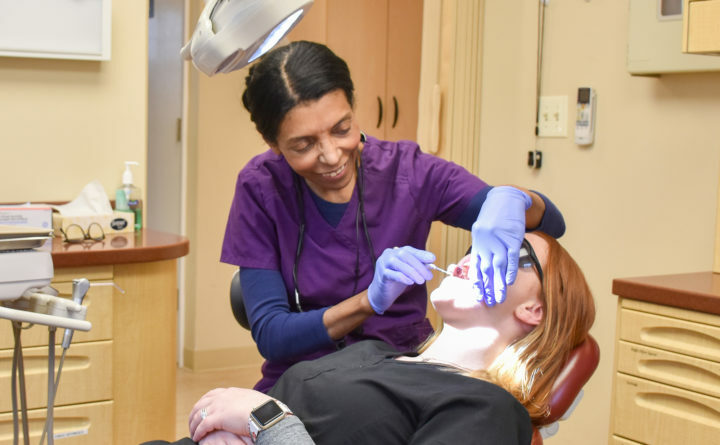 As MDI’s first nonprofit dental clinic, established in 2014, the Community Dental Center is committed to providing access to high-quality oral health care for all ages. The center accepts all major insurance including MaineCare and offers a sliding fee scale for those with no insurance, with discounts of up to 30 percent based on income. For information or to make an appointment, contact the Community Dental Center at 244-2888.